never follow a hippie to a 2nd location: ha! 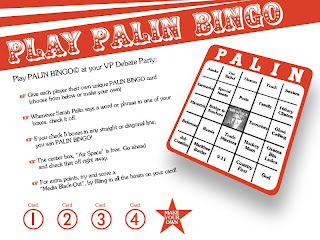 palin bingo...to make the debate even MORE entertaining! I got bored with the debate during minute 2 and didnt play. I think that you are the winner!! i came close. just needed a "heartbeat away" for the row! she sure is a piece of work...sheesh.